Seriously Loblaws? Who’s idea was it for this display? 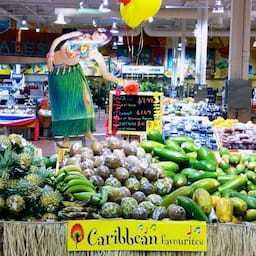 Never mind the cheesy balloons, how is a Hawaiian (wearing a Hula skirt, Leis and a coconut bra) related to the Caribbean? I couldn’t help but laugh and I just had to go up closer to take it all in when I discovered the "fine print" – pineapples: product of Costa Rica; papaya: product of Bolivia; coconut: product of Dominican Republic; plantain: product of Colombia; and mangoes: product of Mexico. Last I checked, Bolivia wasn’t even close to the Caribbean, no? 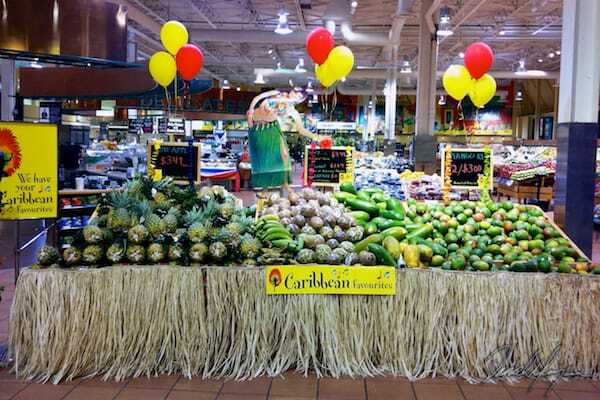 Caribbean Favourites at Loblaws was published on Tuesday, September 18, 2012 at 5:00pm EDT by Daniel Menjívar and last updated on April 11, 2018 at 9:30pm UTC .